[UPDATE, March 26] 27 new spy shots have been added at the beginning of the gallery, below. The Audi RS6 provides a tantalizing mix of performance and utility, and these spy shots catch a heavily camouflaged example of the next-gen wagon on the road. 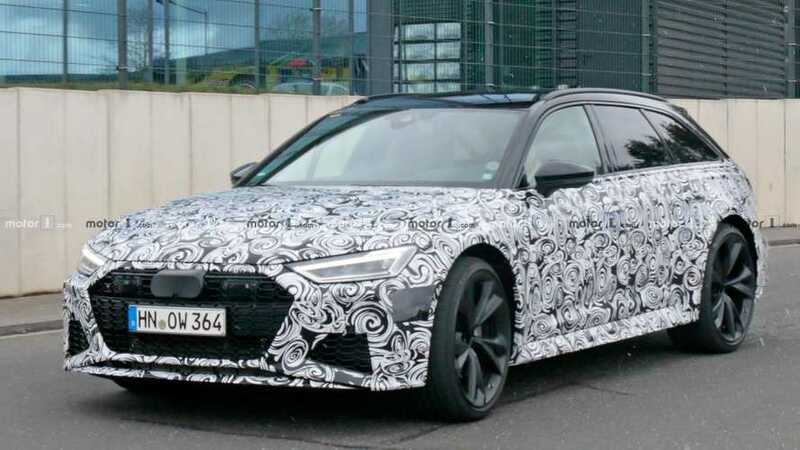 Oddly, this Audi RS6 test mule wears significantly more camouflage than the previous spy shots from June 2018. The concealment can't hide the large corner intakes and more prominent splitter. The black areas on the front and rear fenders are very likely for the sensors for the driver assistance tech. The wagon rides on a set of big, black wheel with five sets of V-shaped spokes. At the back, a spoiler accentuates the roof, and there are a pair of huge, oval-shaped exhaust pipes. There are still only rumors about the new RS6's powertrain. A report from 2018 indicates the performance wagon might have 605 horsepower (451 kilowatts) – the same output as the existing RS6 Performance model – but torque might grow to 590 pound-feet (800 Newton-meters) rather than the current 553 lb-ft (750 Nm). Alternatively, an earlier rumor indicates the RS6 might be available in two tunes. The 605-hp version would be the base model, but power-hungry buyers would be able to pay more for a 650-hp (484-kW) variant. The more potent model might get its boost by being a hybrid. As a range-topping Audi performance vehicle, all-wheel drive is an extremely safe bet for the new RS6 Avant. The one in these spy shots also has cross-drilled brake discs and large calipers. The current speculation puts the RS6 Avant's debut at the Frankfurt Motor Show in September. Sales in Europe may start before the end of the year. The chances of the model coming to the United States are far less clear because the only Audi wagon currently available in America is the A4 Allroad. Bringing an expensive, niche model like the RS6 Avant into the country seems unlikely, but let's hope Audi surprises us.